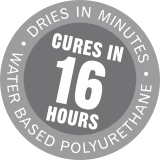 New water-based cross-linked polyurethane with advanced resin technology brings the highest protection single pack ever developed. For the ultimate protection of interior and exterior surfaces to an industrial level of finish. UV blocking and absorption reduce graying, aging and deterioration of surfaces. Biocides protect against mildew, mold and fungus.